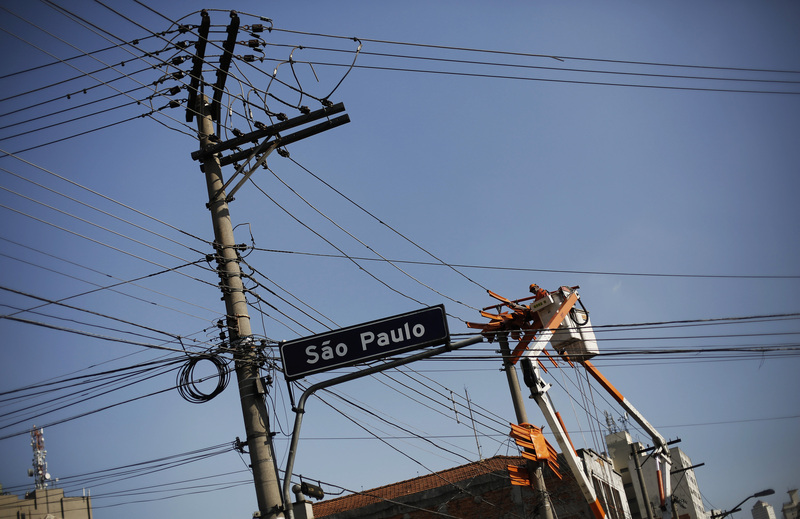 A technician of ELETROPAULO, Metropolitan Electricity Company of Sao Paulo, works on an electrical post on a street in downtown Sao Paulo April 8, 2014. Spanish utility Iberdrola and its Italian rival, Enel, have submitted rival bids for Eletropaulo Metropolitana, Brazil’s largest power distribution company, which is based in the wealthy Sao Paulo area. Local player Energisa had also submitted a bid but said on April 19 it would not raise its bid beyond its initial 19.38 reais per share offer. Brazil’s securities regulator has set a May 18 deadline for companies to bid for Eletropaulo in a live auction on the local stock exchange. Brazil-based Neoenergia, which is controlled by Iberdrola and Brazilian pension funds, on April 26 raised its bid to 32.1 reais per share, higher than two bids it had made earlier in April. Later in the same day, Enel raised its offer to 32.2 reais per share. Reuters on April 26 reported that Iberdrola had attacked state-controlled Enel’s behaviour in a letter to the European Commission. Shares in Eletropaulo closed at 30.5 reais per share on April 25, up about 80 percent from the company’s undisturbed price of 17 reais on March 27.